Our Chalet Host/Chef Couples play a key role within our chalet teams and are absolutely pivotal to the success of our holidays. The combination of warm, engaging personalities and an eye for detail is essential. 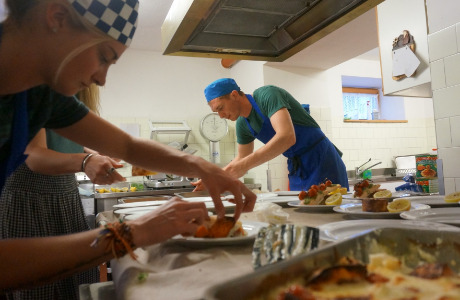 The Chalet Host/Chef positions are open to couples and pairs of friends. Our Chalets are based in the ski resort of Corvara, at the heart of the Dolomiti Superski area and on the famous Sella Ronda circuit itself. The Chalet sleeps between 26 and 30 guests, and entails cooking for up to 40 people, including staff. The job involves the following and much more: welcoming guests and settling them in, ensuring the well-being and comfort of guests at all times, making packed lunches, breakfast and a three course evening meal six days a week, bedroom and bathroom cleaning, changeovers and other general duties pertaining to the domestic management of the chalet (food ordering, simple chalet accounts, laundry etc.). The chalet is run by a team of six or seven people. This is made up of the Chalet Host/Chef Couple and four or five Ski Host/Walk Organisers who accompany our guests on Organised Snowshoe Walks and Ski Days. They are also your fellow Hosts in the chalet, with as much responsibility to the day to day domestic chores and hospitality as you. On a day to day basis they take it in turns to help with the domestic management of the place: cleaning, washing up, dinner service etc., but not the cooking. One of these Ski Host/Walk Organisers is also the Chalet Manager. As a team the emphasis is on creating a home from home atmosphere, and looking after your guests like they were staying in your home. Throughout the week we would expect you to take an interest in your guests, ensuring their well-being and comfort throughout their stay and being interested in them and the progress of their holiday. The hospitality we offer in the chalets is at the core of what we offer as a company. On the whole our clients really are delightful, but very occasionally an ‘awkward rotten apple’ comes along and we expect diplomacy and good manners at all times. It’s part of the job and other guests (understanding your predicament) will admire you for it. Chef / Cook training, qualifications or experience desirable but not essential. If no qualifications then good experience of cooking for numbers in a similar setting. It is however essential that you have a passion for and understanding of food, cooking and sharing this with other people. We pride ourselves on serving excellent quality, home cooked food, well presented and balanced throughout the week, abundant enough to satisfy the hungry walker and interesting enough to impress the food enthusiast. We also cater for special dietary requirements (vegetarian, vegan, gluten free etc. ), so flexibility and an ability to adapt your dishes is essential. A natural willingness to do an early supper for children is important. The job requires good organisational skills and forward planning, as well as an ability to think on your feet and adapt your menus at the last minute.